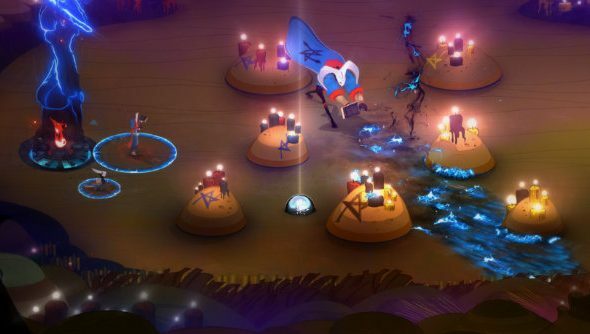 Supergiant Games – developer of Bastion and Transistor – have announced their next game, a party-based RPG called Pyre. Have a look at our list of PC’s best RPGs. You start the game on the brink of death and are revived by some mysterious wanderers. From there you have to learn the truth of the Rites, a secretive competition that allows the worthiest competitors to leave this purgatory and return home, absolved of their sins. This being an RPG, in-game decisions will affect the fates of others and determine who leaves and who remains an exile for all eternity. “Pyre once again showcases our team’s commitment to rich atmospheric presentation and storytelling, along with a distinctive gameplay blend that combines expressive decision-making on the world map with fast, action-packed confrontations against rival groups of exiles whose own freedom is at stake,” says Supergiant Games in the official announcement. Pyre will release in 2017, but an early build will be playable at PAX East this week.